BUTUAN CITY, Nov. 21 - The Department of Public Works and Highways (DPWH) Region 13, through the Regional Project Management Office (RPMO), has completed the construction of the Lower Agusan Development Project (LADP) Flood Control Component (FCC) Stage I, Phase I and II, Urban Drainage System Construction of Relief Pumping Station at Collector Drain (CD) 1 and 2. 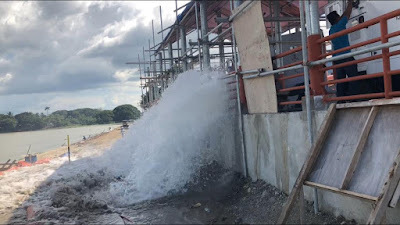 The construction of the relief pumping stations is designed to discharge a combined (CD 1 & 2) 70 cubic meter per minute of flood water impounded along the commercial districts of Butuan City and released into the Agusan River in the event that level of water rises due to continuous rain and other weather disturbances, usually occurring in the last and first months of the year, thereby reducing occurrence of flooding. For decades, flooding has been a looming danger in the highly urbanized city of Butuan that is geographically situated below sea level where agriculture, property and even lives are at constant risk of being under water or swept away gravely in the recent years due to the effects of climate change. Construction of CD 1 and 2 began on June 29, 2017 and was completed on August 22, 2018 with a total cost of P96,499,611.33. These pumping stations are located in the West Bank of the Agusan River – where CD 1 is upstream at Brgy. Silongan and CD 2 is 300 meters away, downstream at Brgy. Urduja. DPWH conducted a trial run on October 26, 2018, and although CD 1 is working well, the flood wall along CD 2 needs to be dug up/opened to provide easier access for the flood water to enter the inlet to sump pit. Once the final inspection and certificate of completion are done, these projects will be turned over to the City Government of Butuan for operation and maintenance with the supervision under DPWH.